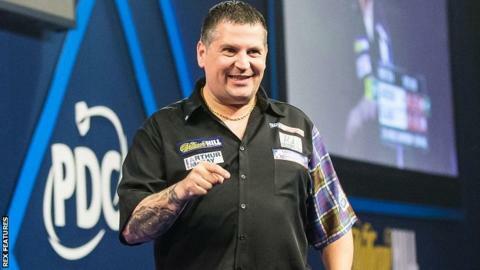 Defending champion Gary Anderson will play two-time winner Adrian Lewis in Sunday's PDC World Championship final. Scotland's Anderson produced a nine-dart finish on the way to whitewashing Jelle Klaasen 6-0 in their semi-final. Englishman Lewis led Raymond van Barneveld 5-0 at one stage before eventually prevailing 6-3. This year's final at Alexandra Palace is a repeat of the 2011 decider, which Lewis won 7-5. Both men have lost only two sets in the tournament so far. Anderson's was the first perfect leg in this year's tournament and the ninth in its history, while he is only the seventh man to achieve the feat. The nine-darter secured Anderson the first set with a 136 average, while the second seed averaged 110 in storming into a 4-0 lead against his unseeded opponent. The 45-year-old, from Eyemouth in the Scottish Borders, continued to pummel former BDO world champion Klaasen in the fifth before wrapping things up with a double 20. Anderson's display will go down as one of the greatest in the tournament's history, while Klaasen will be left to ponder how he lost so emphatically while not playing that badly. Stoke thrower Lewis made a storming start, winning the first five legs and limiting Van Barneveld to four legs in the first four sets, two of which were won with 161 finishes. Former PDC world champion Van Barneveld, who recovered from losing the first three sets to beat Michael Smith in the quarter-finals, won the sixth set against Lewis to avert a whitewash. The 48-year-old Dutchman looked to have squandered a 2-0 lead in the next set but conjured a 134 finish to make it 5-2, before pulling out two more 100-plus finishes to make it 5-3. However, Lewis, who lost to Van Barneveld in the third round of last year's event, finally extinguished his rival's resistance in the ninth set, sealing the win and a place in his third final with a double nine. Lewis, 30, won the tournament in 2011 and 2012. If he beats Anderson on Sunday he will be only the second man, after 14-time champion Phil Taylor, to win three PDC world titles.